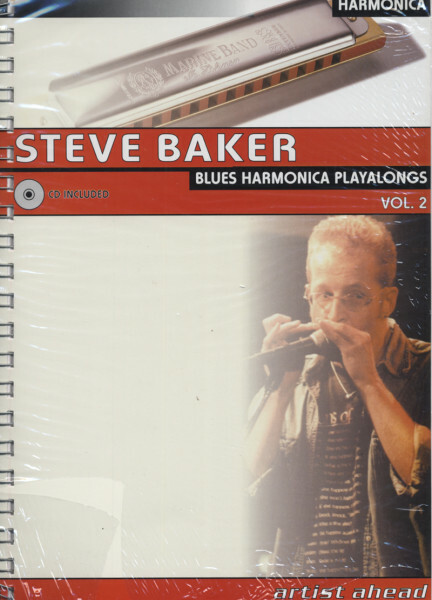 Like its predecessor, Blues Harmonica Playalongs volume 1, this collection of instrumental titles is directed at the intermediate level diatonic harmonica player who is seeking practice material in a variety of styles. Though quite a number of the pieces found here are not strictly speaking blues, they are all closely related to it and employ similar playing techniques. The harp themes are chosen to illustrate typical approaches to these styles and will help you to understand how the top players create their exciting sounds. The 12 titles on this recording cover styles ranging from acoustic bluegrass and country blues to electric Chicago blues, rockabilly, funk and rock. They were specially composed for this project and recorded with a top-line backing band. The majority use the 2nd (cross harp) position, but there are also numbers in 1st, 3rd and 5th positions. Each tune can be heard either with Steves original harmonica, or as a playback without harp. In the book, the harp themes and endings are transcribed using tabulature and musical notation plus chord charts. Each song is given a chapter to itself, with a brief description of the piece, plus detailed explanations of the tricky bits and relevant background information, including numerous tips on dynamics and phrasing. Practicing tips for each song are designed help the student master the specific playing techniques involved. In response to a frequent request by readers of Blues Harmonica Playalongs volume 1, the book also includes detailed transcriptions of many of the solos. This book / CD package fills a big gap in existing harmonica literature and is one of the first publication of its kind specifically written for contemporary diatonic harmonica. It offers the student a unique opportunity to learn directly from one of todays leading players. Kundenbewertungen für "Blues Harmonica Playalongs. Vol. 2. Deutsche Ausgabe"